The A72 main road crosses the River Clyde at the evocatively named hamlet of Wolfclyde, 1½ miles west of Biggar. At the east end of the bridge over the river is a junction from which a minor road heads north. A hundred yards from the junction the minor road passes alongside the remains of Coulter Motte. There was a time in the 1100s when mottes dominated large swathes of the Scottish countryside. Man-made mounds, usually surrounded by ditches, they were seen as an essential base on which to build anything from a full blown tower house or castle to a fortified farmstead. They could be built quickly by anyone with access to a lot of manual labour, and helped give the structure on top, which was usually built of wood, a degree of security in what were very troubled times. It would be fair to say that these days, Coulter Motte doesn't dominate anything very much at all. Indeed, although it is right next to the road, you have to keep a look out for it as you drive past or you will miss it altogether. Part of its problem is its name. If it was known as "Wolfclyde Motte" it might assume rather more presence. 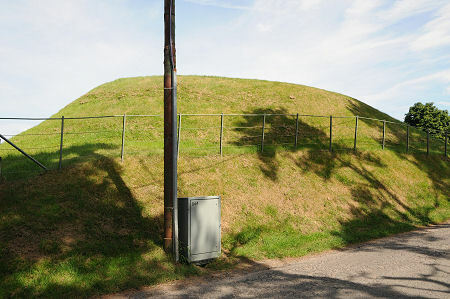 But as it is, what you find is a mound that is some 75ft wide at its foot and whose top covers an area of 45ft by 38ft. The information board on site shows a reconstruction of the, probably rather larger, Duffus Castle, at a similar stage in its development, and gives an idea of what might once have stood on and around the motte at Coulter. Today the top of the motte is some 11ft above the surrounding area. When originally built it would have seemed rather higher as it would have been surrounded by a deep ditch from which much of the material was extracted to build the motte itself. 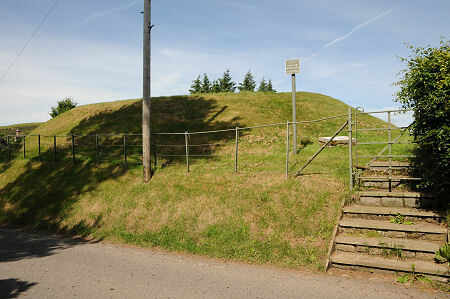 Coulter Motte was probably built in the late 1150s by one of a number of Flemish sheep farmers granted land in Clydesdale in 1155 by the young King Malcolm IV of Scotland. The farmer would have wanted a defensible home, and he would probably have built a fortified farmhouse surrounded by a wooden palisade on top of the motte. With a location right alongside the River Clyde, something that has been less obvious since the building of the minor road on the same side, this would have been a highly desirable residence.